This is an annual tournament organized by the FIH. The event was created by the Pakistan Hockey Federation, and the aim of the tournament is to bring together the six best teams every year and get them to play each other in a round robin format. The first ever men’s champions trophy was held in Lahore, Pakistan, in 1978. The host team beat all the other participating teams in that tournament (Great Britain, Australia, New Zealand and Spain) to win the inaugural trophy. Pakistan also hosted the next two editions (in 1980 and 1981) in the city of Karachi. Pakistan won the trophy in 1980, with the Netherlands winning in 1981. The champions trophy tournament is now held every year and the field has been expanded to eight teams. The last edition was held in Melbourne, Australia in December 2012. Click here for match reports. Australia have won the last five champions trophy titles on the trot, creating an international record. The Australians have won this event a record 13 times. The Kookaburras have also won ten silver medals and four bronze medals at this event. In fact, so dominant have they been in this event that the only times they’ve returned home without any hardware were in 1991 (Berlin), 1994 (Lahore), 2000 (Amstelveen), 2002 (Cologne) and 2006 (Terassa). They did not compete in 2004 after refusing to travel to Pakistan because of security concerns. Netherlands have won this event eight times, with the last time being in Terassa in 2006. Germany has won this event nine times, the last time in 2007 in Kuala Lumpur, Malaysia, beating Australia in the finals. The only other two countries to have won this event are Pakistan and Spain. Pakistan won the inaugural two Champions trophies at home, and also won in 1994 in Lahore. Spain have won the Champions trophy once, beating the Netherlands in the finals at Lahore in 2004. Other countries to have finished on the podium repeated at the Champions Trophy are Great Britain and Korea. Both countries have finished second or third a few times, but have yet to win the Champions trophy. The biggest surprise, however, is India. India has won a lot of gold at the Olympic games and the also has a world cup victory, but for all is dominance, only has a solitary bronze that in won in 1982 in Amsterdam at this event. Australia are the current holders and five time consecutive winners. 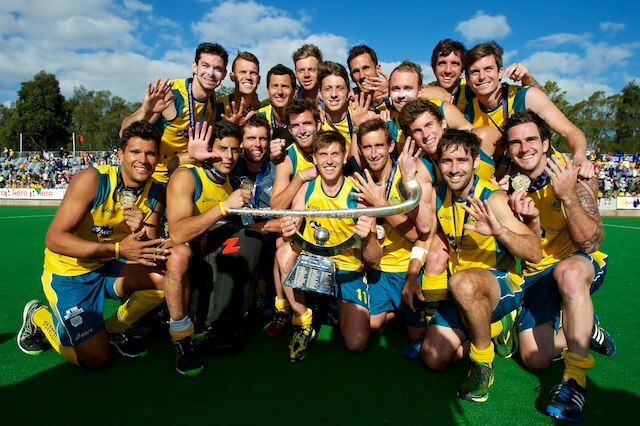 The Kookaburras have won this event a record thirteen times.